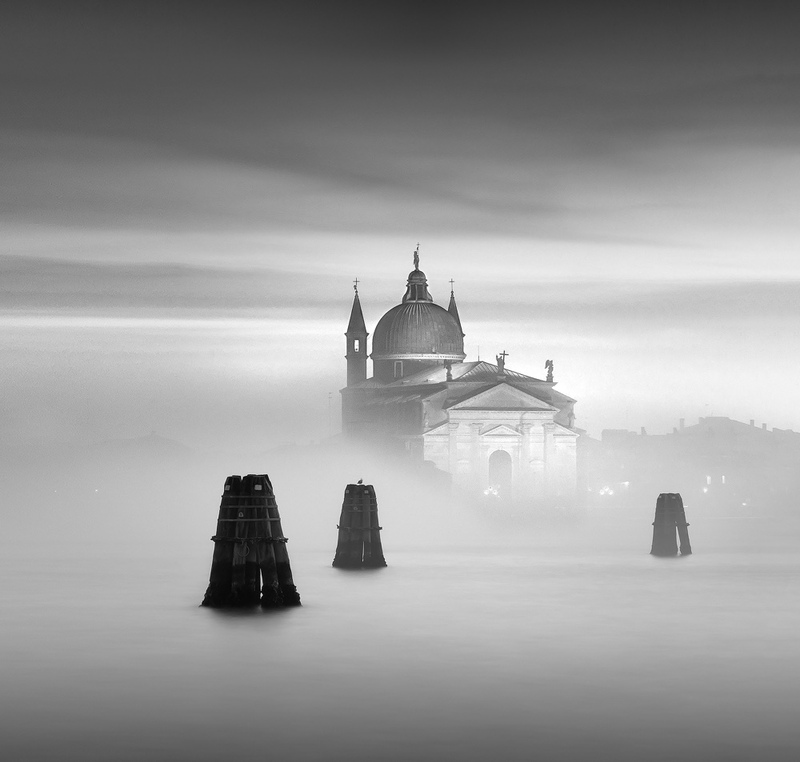 Above: Il Redentore, the 16th century church designed by Andrea Palladio, covered in mist. Photograph by Lisa Katsiaris. Two years ago today, I flew to Venice on my own for the first time. A city where I had never been before, except in my dreams — to meet someone I had never met before, except through my computer. My friends questioned my judgement. My husband was less concerned — not because he didn’t care but because as a fellow architect he understood the compelling draw of a city so strong in one’s heart. You see, I always knew that the first time I went to Venice, I wanted to do it with someone who knew the city well and loved it with all their heart. And here was my chance. Earlier that year, I had interviewed San Francisco based-publicist JoAnn Locktov — she was one of my first interviewees for this site. Having fallen hard for Venice over 20 years ago, she had been returning regularly ever since for 4-6 weeks — always in the late autumn. 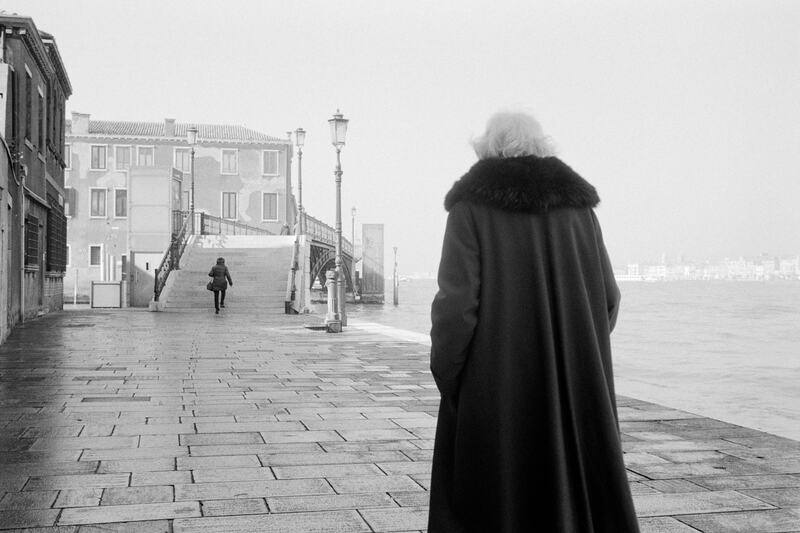 In 2014, her concern for the city’s precarious future compelled her to action and she published Dream of Venice, an ode to the city through Charles Christopher’s mesmerising and mysterious photographs. When JoAnn and Charles decided to do a book together they didn’t have a publisher. After 40 rejections, JoAnn decided in fine Fabster form that she would publish the book herself and founded Bella Figura Publications. Happily Dream of Venice sold out immediately and has been reprinted several times. In 2016, JoAnn published her second book in the series Dream of Venice Architecture. Filmmaker and photographer Riccardo De Cal’s images were accompanied by musings of Venice from international architects and architectural historians. Above: Venetian elegance of another era. Photograph by Roman Henze. And now in 2018, she gives us Dream of Venice In Black and White. Introduced with beautifully, written and heartbreaking words by the Venetian novelist, poet and playwright Tiziano Scarpa, “Dream of Venice in Black and White” paints the magical but beleaguered city’s narrative in chiaroscuro, with contributions from over 50 photographers around the world. And while all 3 are wonderful in their own right, it’s this last one that speaks to me the most because the elegant realism of the light and shadow call to the romantic in me — the woman who flew to Venice on her own to meet someone she had never met before just so that she could see it with someone who loved it well and knew it with all her heart. 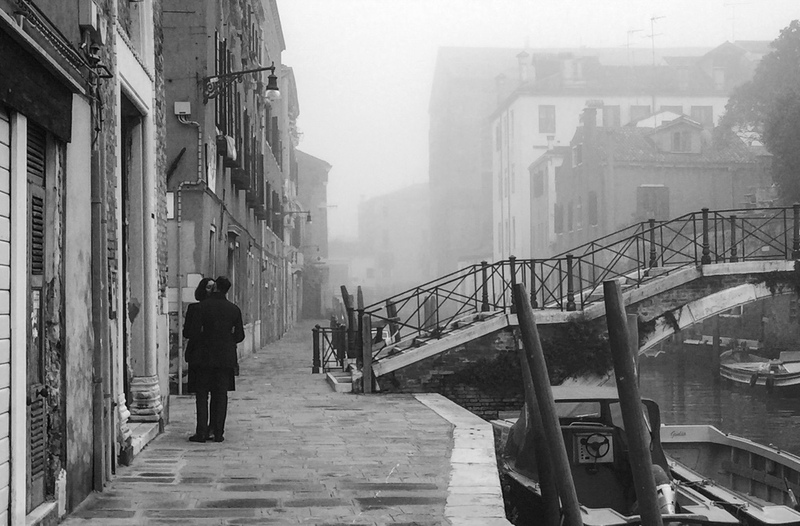 Above: A foggy kiss in Venice. Photograph by Alessandro Sarno. The books make wonderful gifts and a percentage of the sales proceeds are donated to Save Venice Inc., Fondazione Querini Stampalia and the Ikona Gallery. I’m so delighted that you came to Venice and I had a chance to show you why I love the city so much. It was wonderful to see you experience her charms for the first time. Thank you for joining me and thank you for your beautiful support of my books!